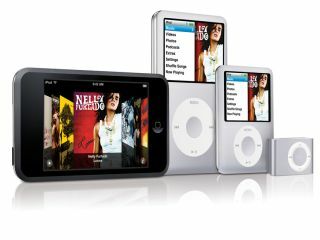 Is your iPod's music all legitimate? Internet service providers in the UK have struck a deal with the Labour government and the music industry in an aim to halt illegal downloading of music. Details of the deal will be announced later today (24 July). It is reported that ISPs (internet service providers) have agreed to send out hundreds of thousands of warning letters to account holders who have illegally downloaded music, and films too. The UK's six biggest ISPs - BT, Virgin, Carphone Warehouse, Orange, Tiscali and BSkyB - are all involved. All involved parties will now liaise to develop ways to deal with repeat offenders. A spokesman for the BPI said: "We have looked to ISPs to acknowledge their responsibility to help deal with illegal filesharing, engage in communicating the issue to their customers, and put in place procedures necessary to effectively tackle repeated unlawful filesharing. It is undoubtedly a serious issue for the music industry as it exists, but is it too late and ill-judged? I have "illegally downloaded" two albums in recent months. Why? Well, they were actually free from official band websites anyway, but those sites kept crashing. So it was easier just to get a fileshare download. I've since bought one of the albums on CD, to get better quality audio. Worth my money. The other, I didn't like that much, so I didn't buy it. But I appreciated the chance to hear the music before I made that decision, even if I actually got the music from somewhere other than the original site. I certainly would not have heard that music on the radio or TV. And it's surely the same for many music fans these days? In fact, it was always the same. Who here has bought / not bought an album after a friend played it to you? It's just that technology has moved on. Indeed, there are so many new models of selling/promoting music emerging constantly, be it from Radiohead, Nine Inch Nails, Mark Westerberg… Yet the music industry clings on to the idea of a bundled-track buy-all 'album' for a pretty-much set price. And hasn't that notion has all but disappeared for many music fans? CD sales in the UK fell 10.6 per cent in 2007, so the record companies are justifiably worried. But musicians are simply getting on with the (not so) 'new economy' of promoting and selling their music. The Charlatans recently gave away their latest album, You Cross My Path, via the website of UK radio station XFM. That album has since, surely, been fileshared to a huge degree. And what does their manager Alan McGee say? "The only people who think that music isn't free any more are the f***ing record companies. Even if you put your album on iTunes, 10,000 Russians will have illegally downloaded it within five minutes. "We gave the last Charlatans album away and it boosted our live performance revenue by 400 per cent. It rejuvenated the band." I wonder if the letters sent out by ISPs will have the same effect for other musicians?